The girls had a bake sale at school and needed some help preparing their contribution. Instead of buying cupcakes at the supermarket, I thought it'd be a good opportunity to teach them some valuable life skills. And by life skills, I don't just mean cooking; madeleines are so good that being able to make them qualifies as a life skill. We decided to make a chocolate madeleine batter and add some mini chocolate chips. 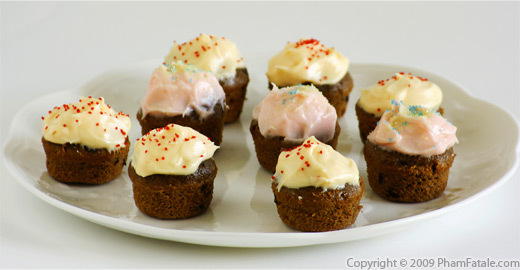 To balance with the chocolaty flavor, we topped the miniature sweets with a mango cream cheese frosting. We ended up making a 150 of them for the bake sale but I think only about 100 of them actually made it to the bake sale! You can of course cut the recipe in half if you want to make fewer. These are the mango cream cheese versions, the one in the middle are the cherry cream cheese ones. In a mixing bowl, beat the eggs with 1 1/4 cup of the sugar for about 6-7 minutes. You'll get a pale yellow foam and the texture of the egg yolk will be thicker. Add the brown sugar, raw honey, vanilla, almond and rum extracts. In a bowl, combine the flour, fleur de sel and baking powder. Sift all the dry ingredients. Cream the butter (6 1/2 sticks) with the remaining cup of sugar (whisk using a standmixer to get as much air as possible in the butter). Add the egg mixture and the dry ingredients. Mix well. Add the melted chocolate and the mini chocolate chips. 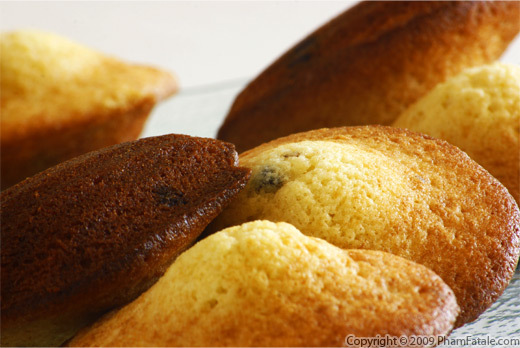 Place about 1 1/2 tablespoons of madeleine dough into two 12-hole mini muffin pan. Plastic wrap the tray and place it in the freezer for about 15 minutes. Remove the platic wrap, then bake the muffins for 5 minutes at 410°F, then lower the temperature to 350°F and bake for another 5-6 minutes. Remove from the oven. Let it cool down completely. 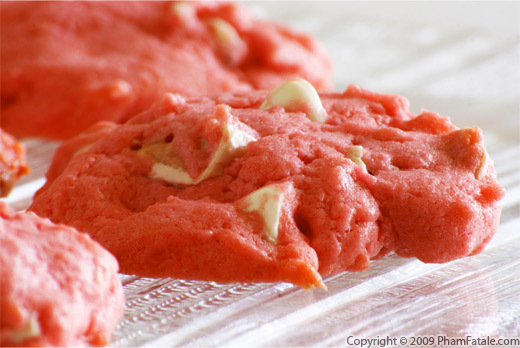 To make the mini-sweets' frosting, whisk the cream cheese and the remaining 3 sticks of butter together. Add the powdered sugar, the red and yellow food colorings and the mango extract. Frost each miniature sweet with the mango cream cheese frosting then top with the colored decoration sugar. To guarantee quality baked goods, use the best butter you can find. The secret to a nice bump on the madeleine miniature tea cake is to put the tray in the freezer for at least 15 minutes or refrigerate the batter overnight. You can also freeze the tray for at least one hour, then transfer the muffin dough balls into bags that I vacuum-seal and place back in the freezer. I think it's the best way to keep the same flavor without getting freezer burn. I keep them exactly the same way I would do with my extra pesto. You can store them up to 3 months in the freezer for last minute surprise guests. The addition of mini-chocolate chips is optional but I think the addition of extra chocolaty flavor is pleasant. I prefer using the Guittard chocolate chips. The Guittard brand carries these adorable mini chocolate chips. You can bake the mini madeleine muffins in a bigger cake pan but I find it more appealing as bite size treats for a tea party. 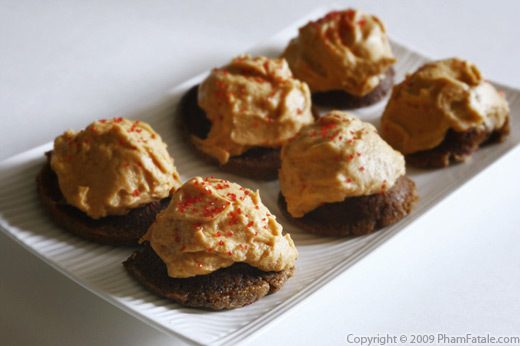 I used a nonstick 12-hole mini muffin pan that I use for my gluten free almond bites with butterscotch frosting as well. 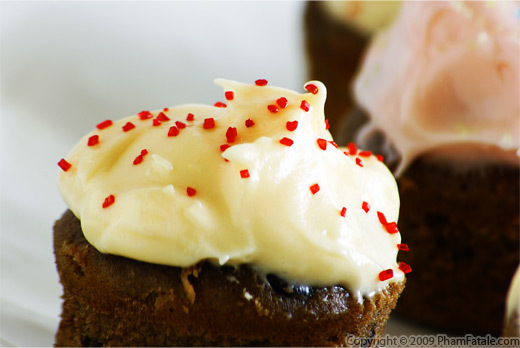 When frosting each miniature sweet make sure the cakes are cooled completely otherwise the frosting will melt. I chose a mango flavored frosting but you can substitute it with any other flavoring that you prefer. I made a cherry flavored cream cheese frosting for my chickpea gluten-free cupcakes. You can also top each mini-sweets with a few strips of dried mango instead of colored decoration sugar. Use the rest of the dried mango for a mango shitake mushroom pizza. Published By: Jacqueline Pham on May 14, 2009. I love mango and mini cupcakes. Thanks for the recipe. I'll make them soon. 150?! Wow that's a lot of cupcakes! Mango cream cheese frosting sounds awesome by the way! Wow, this is an amazing recipe! And very detailed. I'm just hoping I can find mango extract. Maybe I'll use orange. Thanks! I'm very intrigued with the flavoring of your cream cheese frosting. Where can I get mango extract?